Asif Khan's Temple in the Forest pavilion n the courtyard of Palazzo Litta, a beautiful Baroque building that is a hub for cultural events in Milan. The Twiggy Grid by Foscarini in the courtyard of the Palazzo Litta. The Triennale design museum is buzzing and the playful 'Temple in the Forest' pavilion at Palazzo Litta by artist Asif Khan has become one of the week's best places to relax as we head out on day four of Milan Design Week. In the courtyard of the impressively Baroque Palazzo Litta (a building that dates back to Spanish rule in Milan) architecture studio Mosca Partners collaborated with artist Asif Khan to create the 'Temple in the Forest' pavilion, a temporary installation that has become the go-to place for a playful relax this week. Here hammocks made by master weavers are stretched between vertical, ochre-tinged wooden 'trunks' described by the artist as "a clearing in a forest and a place where encounters are fostered”. Foscarini also presented at Palazzo Litta, illuminating the building with the UTO lamps and the Twiggy Grid Outdoor range. In a tribute to the late Luigi Caccia Dominioni, B&B Italia presented a collection of the legendary architect’s furniture inside the historic frescoed hall of Milan’s Umanitariain building. It is a move that highlights why Milan is the undisputed capital of architecture and design and how good the design industry is at the cross-generational exchange of knowledge. In the day, Caccia Dominioni's furniture and interiors became known as the “Caccia style” and the architect played an important role in the development of Italy's industrial arts at the turn of the century. 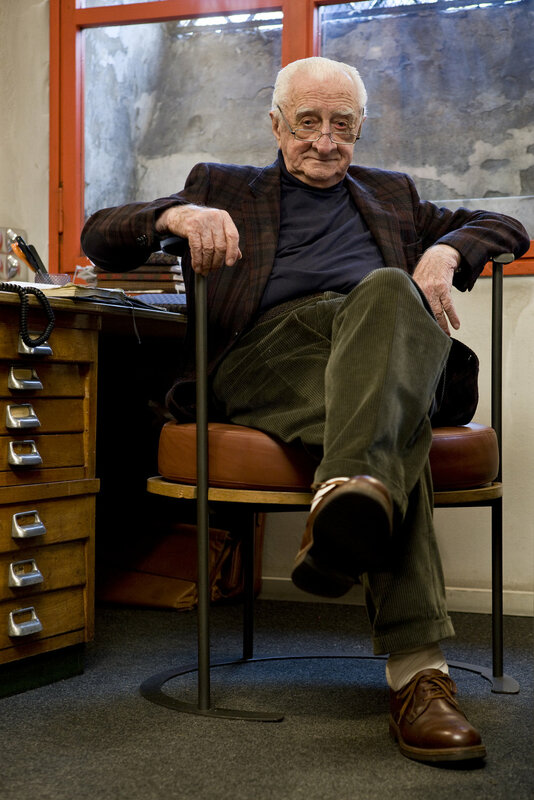 His work is emblematic pf the rich history of Italian design and Gio Ponti once famously described his furniture designs as interpretting a space and expressing its personality. Now 60 years later, Luigi Caccia Dominioni is still turning heads and the collection has been one of the most talked about this year. Recognising the importance of the man, his work and the legacy of his design output, B&B Italia has signed an agreement to produce a collection of Caccia Dominioni's iconic pieces, including the very classic ABCD armchairs (pictured). 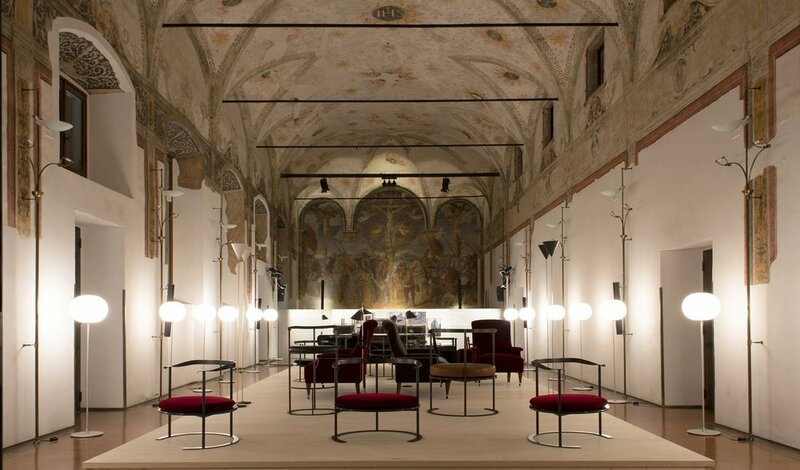 B&B Italia presented a collection of Luigi Caccia Dominioni's furniture inside the historic frescoed hall of the Umanitariain building. The Italian-Danish group Gam Fratesi designed the Kite sofa for Porro that feels Scandinavian in its clearly articulated form. With two shows in Milan this year, Italian furniture brand Porro collaborated with designers Gabriele and Oscar Buratti, Serena Confalonieri, Gam Fratesi, Carlo Tamborini, and Piero Lissoni who also designed both installations. It could be said that Porro has a Scandinavian approach to form and materials: clean lines and simple, raw materials are symbolic of each collection. That philosophy is then embedded with the Italian approach to detail: stitching each collection together like a well-tailroed suit. Brothers Gabriele and Oscar Buratti designed the Jeff table for Porro: a solid chestnut surface appears suspended on two metallic bases as thin as a piece of paper. The Ryoba table by Piero Lissoni for Porro pays homage to natural materials and the beauty of imperfection. Highlights from the newest collection include the Ryoba table by Piero Lissoni that pays homage to natural materials and the beauty of imperfection, combing a simple drawn brass tube frame with a table top in raw European cherry wood. The Italian-Danish design group Gam Fratesi created the Kite sofa that feels very Scandinavian in approach in all its pared-back form and elegantly curved tubular structure. It is described by the designers as a "haute couture coat with a raised collar”. It’s also a classic and very Porro. While Brothers Gabriele and Oscar Buratti designed the Jeff table with a solid chestnut surface that appears suspended on two metallic bases with an open half curve as thin as a piece of paper. It’s an interesting play between materials and the table is exquisitely made. Every year the Triennale Museum launches their design week program that this year hosts more than 10 shows. It not surpising that it has become the most popular place to soak up Milan's history and design culture. The Targa lounge designed by Italian-Danish design team Gam Fratesi for GTV. Our final destination is Gebrüder Thonet Vienna (GTV). Here classical materials and forms from the group's turn-of-the-centrury Austrian heritage are underpinned by new creative interpretations embracing the brand's artisanal workmanship and industrial production. This contemporary refresh first gained attention with the collaboration of Swedish designers Front. 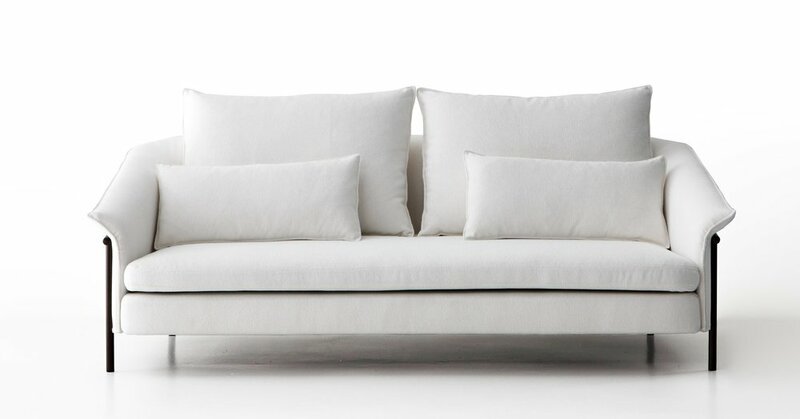 This year GTV worked with the Italian-Danish design team Gam Fratesi (who had a very bus time in Milan this year) to produce the new Targa sofa that is both classic and contemporary and expands the GTV lounging range. Other standouts include the Loie armchair designed by Chiara Andreatti and Cristina Celestino's Caryllon table series – side and dining tables in earthy reds, olives and natural timber. It is a range that is feminine and artful and introduces a wood-carving technique that goes back to traditional marquetry. It is that level of tradition – tweeked just so – that is alive and kicking at the shows this week. more space will be back next week with a final wrap-up of Milan Design Week. All images by Space Furniture's photographer on the ground in Milan, Filippo Bamberghi, and supplied by GTV, B&B Italia and Porro.